A look into the DNA of dividing cells in a human duodenal enteroid. Using enteroids grown from patient biopsies and surgical samples, Johns Hopkins gastroenterologists are studying the way diarrheal diseases such as cholera attack their hosts. Along with his Johns Hopkins gastroentrology colleagues Julie In and Jennifer Foulke-Abel, Mark Donowitz is working on finding treatments for diarrheal diseases that infect millions of people and kill hundreds of thousands of children around the world every year. Using “mini-intestines” they cultivate from patient biopsies and surgical specimens, the researchers study the way diarrheal diseases like cholera, shigella and even travelers diarrhea attack their hosts. Early work in growing human intestine tissue models, known as enteroids, yielded spherical or other solid shapes. Donowitz’s laboratory was among the first to grow the enteroids in flat sheets, allowing a realistic simulation of the conditions of the lumen. Donowitz points to a recent example of a collaboration with a drug developer that engineered a drug to inhibit a protein implicated in diarrhea. He says that, when the mini intestines were exposed to the new drug, researchers saw that the chloride channel known as CFTR was blocked, interrupting the chain of reactions that trigger diarrhea. Donowitz believes the drug, which he says is in the early stages of development by a pharmaceutical company, could be significant. Researcher In is using enteroids to explore ways that colon tissue regenerates after severe diarrheal disease. She says that her research is pointing to a universal system of regeneration, no matter the origin of the damage. The process of cell regeneration after enterohemorrhagic E. coli (ETEC), she says, looks similar to the process after an inflammatory bowel disease flare-up. Donowitz says that, while his hypothesis is unproven, human enteroids appear to provide a better research model than mouse intestine or colon cancer cells. As Foulke-Abel’s research team dug deeper into the comparisons of the two bacteria, she says enteroids provided insights that animal testing could not. They’re beginning to study cocultures of epithelium and nerves, following a longstanding suspicion that about half of diarrheas have a neuronal component. 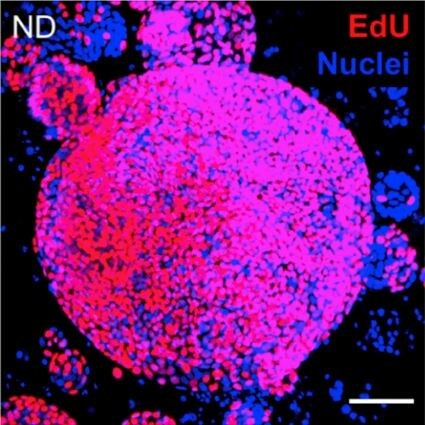 In addition to research of global bacterial diseases, Donowitz says human enteroids hold potential in the burgeoning field of personalized medicine. Since enteroids are grown from tissue taken during biopsies or surgeries, they retain the characteristics of the patient from whom they were taken.